AC Kinetics’ new motor drive software increases AC induction motor performance and energy efficiency simultaneously, overcoming a major industry roadblock. Designed by a team of optimization and motor control experts, the revolutionary motor drive control enables — for the first time — the use of a minimum-energy consuming drive in any application including those requiring rapid transient response, minimal overshoot and settling time, and insensitivity to load disturbances. The advanced software, supported by real-time adaptive algorithms, runs on standard drive hardware for motorized equipment in the consumer, industrial, and transportation markets. The software optimally generates torque on demand in a maximally efficient manner. There are no parameters to adjust or control gains to tune. The AC Kinetics software automatically configures itself to achieve a level of motor performance and energy efficiency unreachable even by hand tuning present day drives using instrumentation. Both performance and energy efficiency are important to AC induction motor applications. Modern control methods for variable speed AC induction motor control trade off performance for energy efficiency, and vice-versa. The AC Kinetics drive software employs a novel control architecture designed from the ground up to realize rapid dynamic performance while minimizing losses in the motor. This control architecture seamlessly integrates real-world nonlinear motor phenomena, including core loss, nonlinear inductances, and saturation in the motor and inverter. Conventional drives use a significant amount of energy to maintain performance, but much of this energy is dissipated as heat. The AC Kinetics drive software achieves the best performance without wasting this energy by always providing the optimal electrical inputs for the motor in every situation. High efficiency results in less wasted energy released as heat, leading to cooler motor operation. This extends motor life and reduces cooling requirements. The control algorithms are hardware proven and have been tested extensively against a variety of commercial drives on the market today. 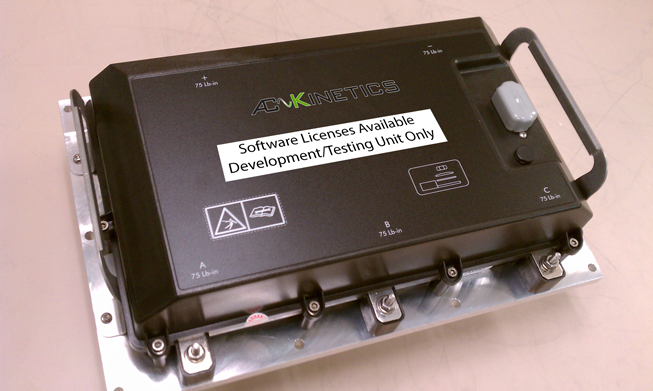 AC Kinetics’ induction motor drive software is the next generation in AC drive control. AC induction motors were originally powered directly from a fixed frequency mains supply which did not allow variable speed control of the motor. Instead, motor shaft speed was load dependent. In the 1960s, the V/Hz (Volts-Hertz) drive was introduced, which enabled variable speed control of the AC induction machine while attempting to maintain a constant flux in the machine across its operating range. In the 1980s, as DSPs and power electronics advanced, vector control became the new standard. Vector drives greatly increased the possible areas of application for induction motor control. Now, AC Kinetics has taken AC drive control to the next level. Optimal performance and efficiency are ensured across the operating range of the motor, leading to significantly reduced energy consumption and achieving a greater level of performance than ever before possible.